On 13 July, NASA launched the Nuclear Spectroscopic Telescope Array (NuSTAR), an orbital X-ray telescope that can produce detailed images in high-energy. 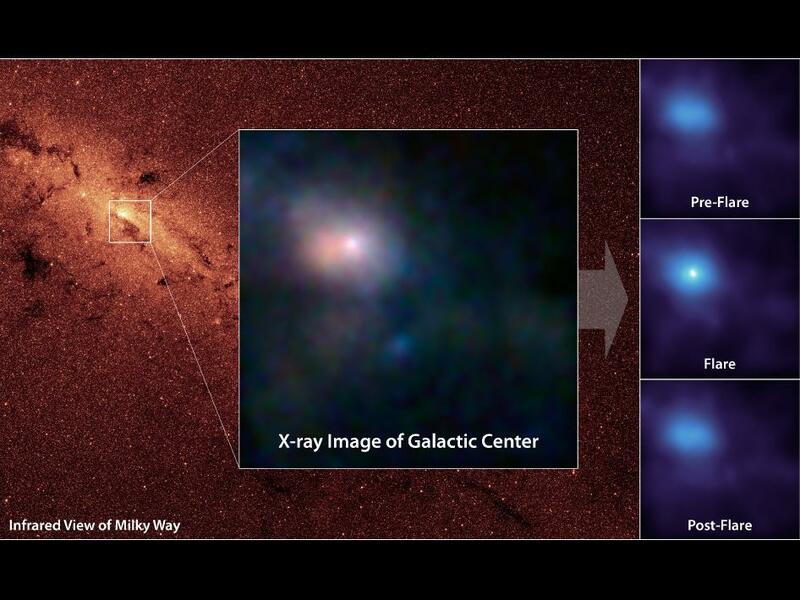 Now, NuSTAR has directly observed the supermassive black hole at the centre of the Milky Way galaxy (known as Sagittarius A*, or just Sgr A*) flaring up as material falls in. Unlike some other galaxies, the Milky Way has a relatively quiet and inactive black hole at its core. Although black holes themselves can not directly emit anything — their immense gravity only allows one-way traffic inwards and nothing, not even light, can escape — powerful tidal forces and magnetic fields ensure that anything falling in is ripped apart and heated to immensely high temperatures before finally vanishing behind the event horizon. It is this super-heated cloud of material which shines so brightly, and the amount of unfortunate material falling in is what determines how active the black hole is. For two days in July, NuSTAR’s operators teamed up with other observatories including the Keck observatory in Hawaii and NASA’s orbital Chandra X-ray Observatory (which looks at lower-energy X-rays than NuSTAR), and were fortunate to witness the flare-up. According to the data received, whatever fell into Sgr A* was shredded so violently that even the individual atoms were torn apart from each other. The resulting cloud of plasma was heated to a temperature of about 100 million degrees Celsius and was accelerated to almost light speed, causing the emission of the high energy X-rays which NuSTAR could see. Astronomers say these NuSTAR data, when combined with the simultaneous observations taken at other wavelengths, will help them better understand the physics of how black holes snack and grow in size. “Astronomers have long speculated that the black hole’s snacking should produce copious hard X-rays, but NuSTAR is the first telescope with sufficient sensitivity to actually detect them,” said NuSTAR team member Chuck Hailey of Columbia University in New York City.